The clock was damaged by heat from a fire in a historic house. Most of the damage occurred to the finish of the clock without affecting the veneered rosewood case. Unfortunately, the glass covering the face of the clock and the reverse painted glass panel were both cracked and badly damaged by the heat. 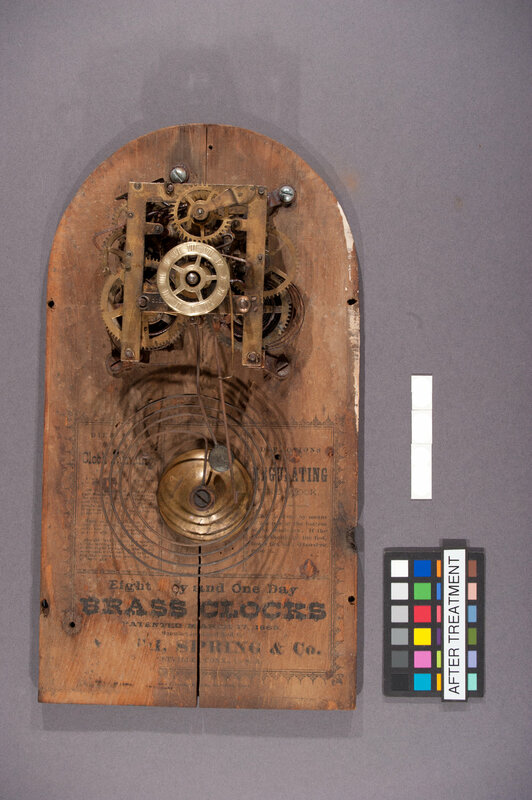 The clock case was disassembled followed by the removal of the damaged finish. Interior components were surface cleaned as possible to reduce soot and mold. The paper label was consolidated and mended. Visible components of the works were polished, however they were not restored to working condition. The paper dial was surface cleaned, mended and inpainted with pastel and watercolor to unify its appearance. The remaining gilding fragments on the columns were documented and sealed to isolate that layer from the restoration gilding. Replacement glass was cut to cover the dial and an identical reverse painted glass panel was obtained. The original glass components were cleaned and stabilized as possible, then boxed for storage.